Globally, nitrogen fixation involving symbiotic rhizobia is the major source of nitrogen input for many important food crops, such as peas, lentils, soybeans and chickpeas. The rhizobia represent an excellent model system for investigating questions of fundamental biological significance, such as understanding the molecular mechanisms required for a cell to adapt to diverse conditions, both in the soil and during infection of a host plant. The objective of my research program is to identify and characterize cell envelope genes and regulatory pathways that are required to modulate the composition of the cell envelope during Rhizobium leguminosarum's adaptation to varying soil conditions, and during plant infection. The cell envelope is an interesting target for studying bacterial adaptive responses to stress since it is the first line of defense against external stresses and maintaining its integrity is a prerequisite for survival within the external environment as well as a host. For example, we are interested in understanding how R. leguminosarum modulates the cell envelope to survive environmental stresses, such as drought induced desiccation. My lab uses a genetics based approach to identify genes that are important for the function and maintenance of the cell envelope. Using this approach we have identified several uncharacterized genes that appear to be important for proper cell envelope function and cell morphology. 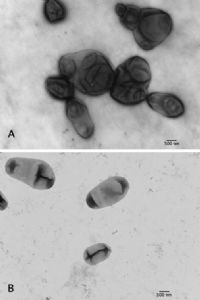 Examples of mutants with unusual cell morphologies are shown in the accompanying transmission electron microscope picture. The mutant is shown in panel A and wildtype is shown in panel B.
R. leguminosarum fixes nitrogen for several important food crops that are grown on the Canadian prairies including peas, and lentils, and predictions estimate that by 2028, 1/3 of the annual crop base in the prairies will be in these pulse crops. In spite of this, relatively little is known about this agriculturally important Rhizobium species. A better understanding of how R. leguminosarum modulates the cell envelope to survive in soil and during infection can help agri-biotech industries create more effective inoculants designed to increase legume crop production for Canadian farmers. Furthermore, Canada is a global leader in the agricultural biotechnology sector and the students receiving training in my lab develop skills in molecular based approaches that are sought after by agri-biotech employers, positioning them well for future employment in this expanding sector. The research in my lab is categorized within the general area of Environmental Microbiology. We use molecular and genetic techniques extensively in our work and being an environmental microbiology lab we also spend a lot of time in the field. Therefore, we play with lots of cool lab toys in addition to enjoying outdoor time in the field sampling.